​Your car will always run hot as long as the engine is on. This is because the movement of different parts creates heat. The car will always run hotter during hotter seasons such as summer. You, therefore, need a functioning cooling system. Otherwise, your precious machine could get grounded. Apart from the inconvenience of having your car break down, repairs would also cost a lot. This is why you need to always ensure that your water pump is in good shape. 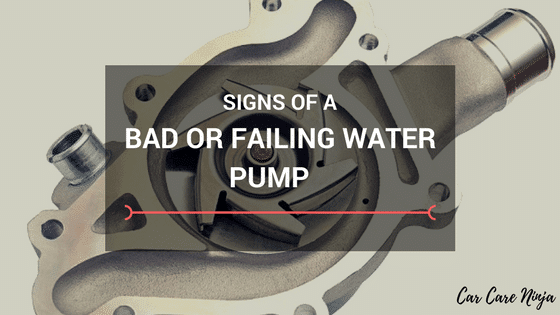 You also need to learn the​ signs of a bad or failing water pump as it could save your car in the long run. After all, a stitch in time saves nine. Related: How long does a catalytic converter last? ​Why Do You Need a Water Pump? ​In order for your engine to stay cool, it needs a constant supply of coolant to regulate the temperature under the hood. This coolant flow is primarily maintained by the water pump. This, therefore, means that you need this pump no matter how advanced your car, truck or SUV is. The water pump is often located on the side of the engine and under the timing belt. When it comes to function, the engine’s drive belt influences the water pump. Once the engine belt moves, the blades on the pump turn causing coolant to travel through to the engine then back to the radiator so it could be cooled. It is obvious that the pump is integral to the engine’s cooling function. If it wears out, breaks down or is damaged, you run the risk of your car overheating and stalling. ​All these factors will cause the water pump to malfunction in one way of another. ​Now that you know what might cause your pump to fail, you also need to get acquainted with the signs that point to a failed pump. This is important because if you catch it early enough, the problem could be fixed without having to replace the whole system. This would be much cheaper to deal with and would also be less time-consuming. The one sure sign that your water pump is broken is a grinding high-pitched noise coming from under your hood. It is possible to hear this noise while driving. It often gets louder when you increase speed. However, to be sure about this, lift your hood and let your engine run. Gently place your head under the hood to check for any unusual noises.The reason for the grinding and groaning noise is because the bearings overheat without grease. The grease is washed out when coolant leaks onto the bearings. You need to contact your mechanic to diagnose the problem once you hear these noises. If you do not fix the problem immediately and keep using the car, the bearings could break causing the pulley to fall apart. When this happens, you will lose all engine functions. Consequently, you will need to part with a lot more to have it fixed. Leaks are a sure giveaway when it comes to broken or failing water pumps. One way to know that your coolant is leaking is finding red or green fluid on the ground under your car after you have parked it. Granted, a lot of leakages happens as the car is running. However, some residual leaks can still be detected after the car is parked. Leaks could point to other non-water-pump-related problems. This is why you need to further inspect under the hood of your car. If there is a weep hole leakage, this will confirm your suspicion about water pump failure. You might also notice leaks on the mounting surface. Once you notice this, it is time to get help from your mechanic. He or she will accurately diagnose the problem and suggest necessary repairs. In an ideal situation, your car ought to have constant engine temperatures throughout. In some cases, you will find that the engine temperatures fluctuate drastically between cool and hot as you drive. This might be as a result of one of two things: a faulty radiator or a faulty water pump. This should prompt you to get a mechanic to investigate what the cause is. If it is a failing water pump, it means that your cooling system is not operating as it ought to be. The cooling process is therefore not taking place as it ought to be. The coolant is therefore not circulating through the engine and to the radiator to be cooled then circulated back. ​These additional damages push up the cost of repairing your vehicle. You can also see this for more details. ​The main reason why it is unwise to ignore the signs of a bad or failing water pump is that it could compromise the function of your car. A faulty cooling system affects the engine and related parts. Consequently, this puts a stop to all engine-derived functions in your vehicles. The other important reason why you should not ignore the signs is that these further damages will force you to spend much more on repairs. These extra costs could be saved if you addressed the problem in good time. At the end of the day, you want a car that is in good shape and running efficiently. I would recommend roping in your mechanic on water pump diagnosis or repairs since it is a sensitive issue. It would be a gamble to try and fix the problem yourself as it has potential to go horribly wrong and lead to further damage.